Well lets first look at the details. Predictably, the Chef’s Choice patented 3 stage system process is employed here, utilising 100% diamond abrasives. The Chef’s Choice BiLevel Magnetic guidance system is used for each slot so there is no guess work involved when obtaining and maintaining the correct angle throughout the sharpening process. The unit is definitely versatile, with kitchen knives, fishing, hunting and pocket knives being catered for. 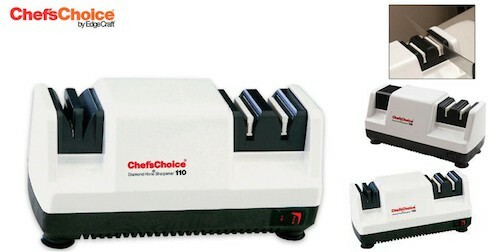 For serrated knives however, Chef’s Choice themselves recommend the 120 or 320 series of electric sharpener. For easy cleaning, magnetic pads collect any metallic residue as a result of sharpening. So how does the 110 professional actually perform? The user reviews across the internet are rather split on this one. While the majority do sing the praises of the 110, (comments such as, ‘a must for any kitchen’, ‘best sharpener I’ve ever had’ are not unusual), there are those that actually experienced damage to their knives when using the unit. Others found it more difficult to use than advertised, and on a few users have reported that the electric motor controlling the sharpener actually burnt out after extensive use. One particular scaling review can be found here, citing the 110 as the worst knife sharpener ever. With such conflicting responses to the Chef’s Choice 110, it seems as this has been one of the worst received products on the Chef’s Choice range in recent years. 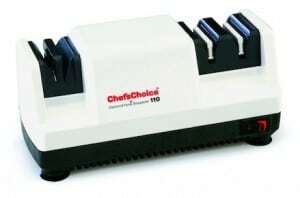 As a result we would certainly recommend the likes of the Chef’s Choice 120, or the Trizor, (both of which made it into our top 10 list of essential knife sharpeners). Tried and tested, these sharpeners are still very much affordable and provide better overall performance and reliability. Easy to clean. Accumulated metal dust in the presharpening stage, can be simply removed via the circular plastic plug located on the underside of the sharpener.